OUR FUN FELT PRODUCTS Our felt products are made by old Tibetan lady (now 60 years old), she started her felt products by her self that she learned fr.. 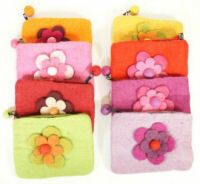 Handmade felt wallet with zipper and flap cover Hand made in Nepal.. Handmade felt wallet with zipper closer with fun flower About 5" diameter Hand made in Nepal.. Handmade Felt Backpack is all lined inside black cotton with Zipper closer flap close with Velcro. Handmade in nepal width:12" height:11" .. Handmade felt Bag is all lined inside with Black cotton fabric with Zipper closer and flap close with Velcro with beautiful felt flower in front of th.. Handmade felt Bag is all lined inside with Black cotton fabric with Zipper closer in Red color with felted flower design on the bag. Bag:16" wide and ..